Working through a collection of popular mics to compare and verify accuracy for measuring in-room loudspeaker response. The test subjects; at rear, left to right: dbx, DPA, Behringer, Nady, Josephson, Radio Shack SPL meter, AKG, Earthworks. Foreground: Neutrik (left) and Mitey-Mike. People often ask which affordable microphones I recommend for measuring rooms. Best is a condenser microphone having a small diaphragm for an extended high-frequency response. If the diaphragm is small enough, its self-resonance will be higher than 20 KHz. Many “tiny diaphragm” mics, such as those from Earthworks and DPA, have a usable response to past 20 kHz, and they’re ideal. But most of these types cost more. 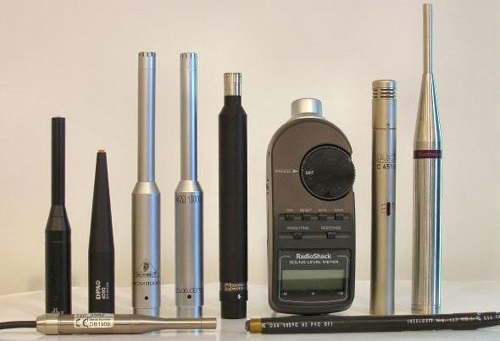 With the help of my partner Doug Ferrara and some friends, I gathered up nine popular mics ranging from an inexpensive DIY model to a Josephson model with a Microtech Gefell capsule that costs $1,800. Five of us got together in my large one-room home studio to compare them. Note that this test did not attempt to evaluate anything other than raw frequency response. We didn’t measure distortion, maximum sound pressure level (SPL) capability, build quality, or residual noise. Nor did we record any musical instruments. Our only goal was to determine the suitability of these mics for measuring in-room loudspeaker response. I created a sort of “anechoic chamber” using six RealTraps MiniGobos acoustic absorbers in a semicircle, plus two more MiniGobos to absorb and deflect potential reflections from the front of the room. One more HF-style bass trap reduced any floor bounce reflections. The test setup is shown below. The room and configuration of the testing. Since this isn’t a true anechoic chamber, you’ll see some influence from the room, especially at low frequencies. So even if a particular mic is perfectly flat, its response will not appear flat in the graphs due to the room. However, the relative responses are valid, letting you compare how closely the inexpensive mics match the expensive calibrated models that are known to be highly accurate. The mics were suspended 25 inches in front of a Mackie HR824 loudspeaker, whose published response (-3 dB points) extends from 37 Hz to 21 KHz. The capsule tips were positioned on-axis to the front of the tweeter. To ensure that all mics were in exactly the same place (within 1/8-inch in all directions), a piece of string was stretched to set the height and distance from the loudspeaker. An ink mark on the string identified the horizontal location. Each mic was lowered so its tip was exactly 1 inch below the string to avoid potential minor reflections from the string itself. However, there were actually 11 subjects in this evaluation because we also tested two different Radio Shack SPL meters – an analog model about 20 years old and a more recent digital version. Both meters were set for C weighting. The mics were hanging from their audio cable pointing straight down, though we also tested one of the SPL meters pointing toward the loudspeaker. Although omnidirectional mics supposedly receive sound equally from all directions, when measuring room acoustics the convention is to aim the microphone straight up. No omni mic has exactly the same frequency response from all directions, though units with tiny diaphragms and slim bodies are often more uniform than larger models. So when balancing loudspeaker volume levels on a surround system, pointing the mic toward the ceiling favors all of the loudspeakers equally.